As Dean had missed out on his weekend trip due to "Alarm Failure" i hastily arranged this midweek outing to compensate. It was also the last opportunity to fish during the week before my shift pattern changes for the next Seven nights. 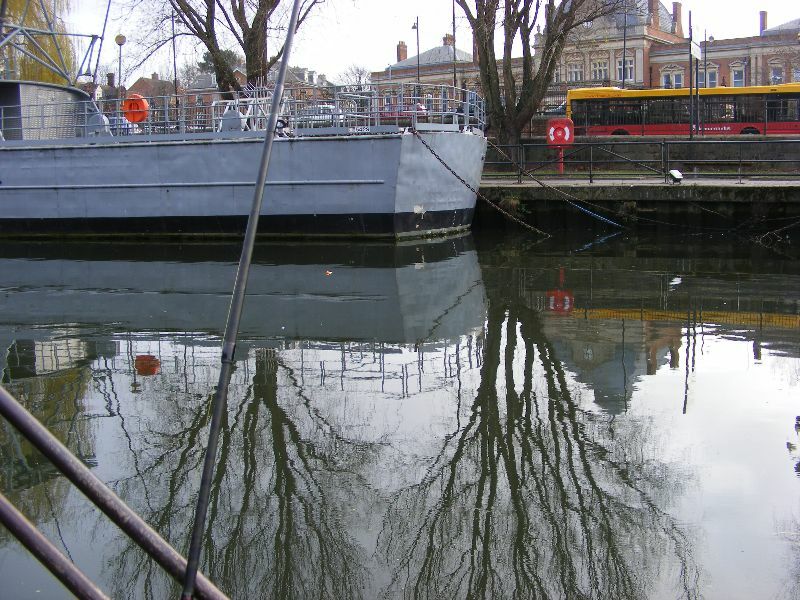 With no wind and an overcast day in prospect we decide to take the boat down to the city centre and fish the Hotel Nelson swims. 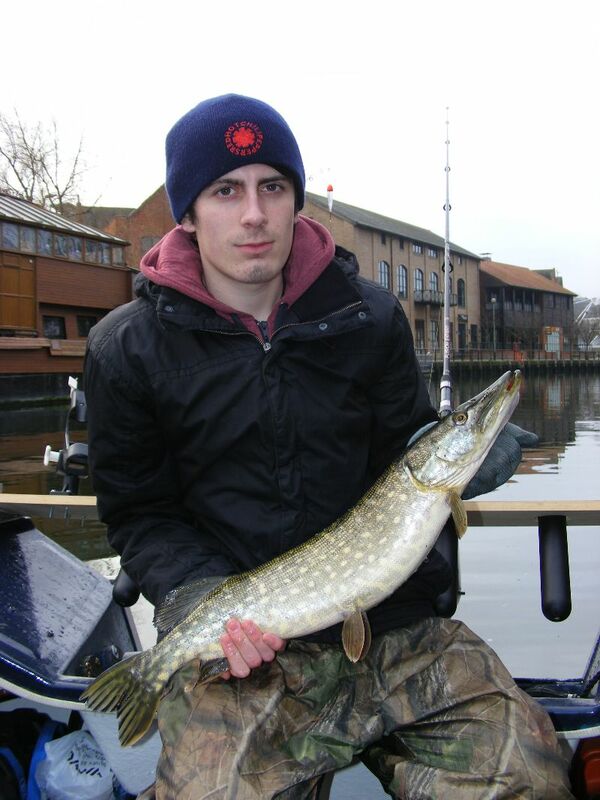 We eventually collected a few live baits in the marina, mostly very small again though, before heading into the city. I tackle up Two rods each as Dean pilots the boat. One live bait paternoster and one float ledger rig on each. Its almost 9:15am when we make our first casts, both choosing a live Roach on one and either a Smelt or Bluey dead bait on the second rod. 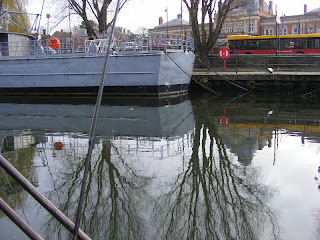 I fish over against the Scout boat while Dean fishes to the floating restaurant. Its an hour before Deans live Roach is taken. A lively 4lb Jack being responsible. We then go almost another Two hours with no further activity before Dean gets another take, again on the live bait. A slightly smaller Jack is boated this time. 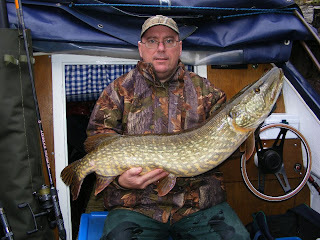 Almost as soon as this fish is unhooked and slipped back, Deans Float ledgered Smelt goes and he is into a better fish. 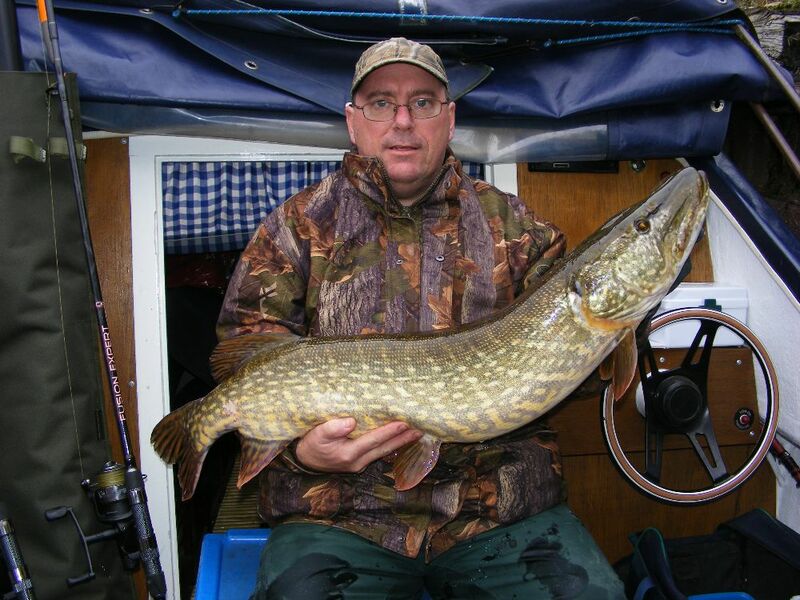 This Pike goes exactly 10lbs and gets us checking and moving our baits in anticipation of more action. 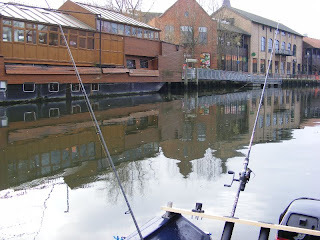 No sooner i had moved my Float ledgered Bluey close into the bottom shelf nearest the boat, its taken. It does not feel that big at first, just gentle short runs in and around the boat but keeping deep. As i lean into it, it suddenly surfaces and realises its hooked and goes mad. I keep the pressure on and Dean nets it first time before it can gain too much line. As soon as we lift the net into the boat we realise this is a decent fish. I also notice the fish has been towing some unwanted baggage in the form of several sets of hooks, wire and line all now on the mat next to the fish. I quickly "snip" off most of the hanging debris and then prepare to remove my hooks. Both of my trebles are just inside the mouth and pop out fairly easy. As i look around its mouth, i find Three other sets of tackle and set about removing them. The first lot is clearly the case of "Too lightweight" and looks like 2 size 8 trebles attached to very thin wire and crimps. With them out the way the next set is very strange. A single size 10 hook with a small "Hair" on it an one grain of yellow fake corn !!! This fish must have been hungry. The Third set of gear is more serious. 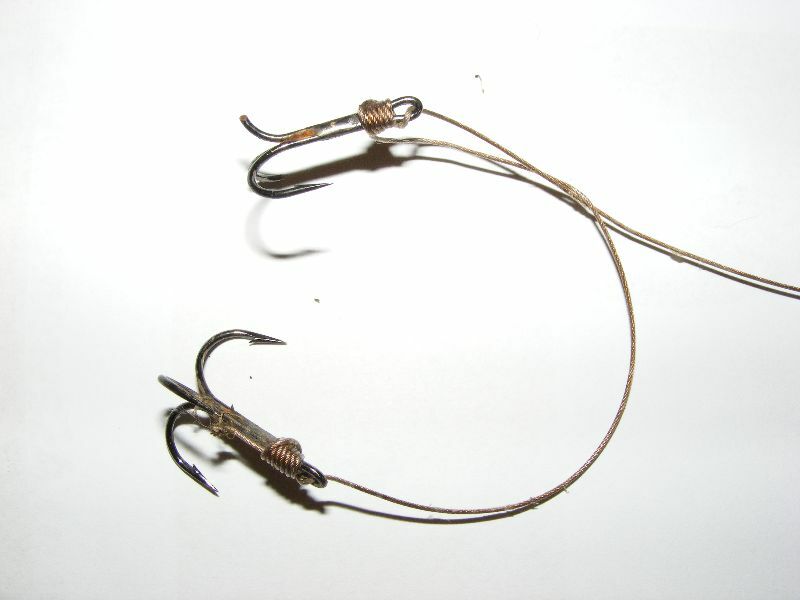 Two big size 4 heavy duty trebles mounted on at least 20 inches of 50lb wire. Both hooks are quite deeply embedded in the scissors and i have to cut off each barb individually of one treble to release it. 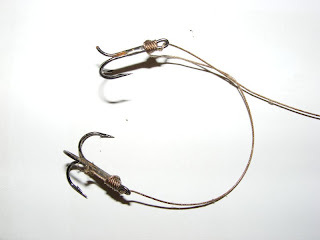 Once that's out of the way the other hook is removed fairly easily and its all clear. If this wire had become tethered there is no way this fish would have survived! The fish then went into a sling over the side to rest while we set up the weighing gear. As we lift her back into the boat its already fully recovered and we record a weight of 20lbs 4oz, a new PB for me and also my fist ever "20". Dean then rattles off a few quick pictures before the fish is telling us its had enough and wants to go home. Back into the sling and over the side and its away instantly. Probably in a rush to get eating again without all its trailing tackle in the way ! All this action has happened in a 20 minute spell and its now almost 12:45pm. Dean re positions his rods but im content to just eat my lunch and have a coffee. With no other activity we pack up and head back to the marina around 2pm. 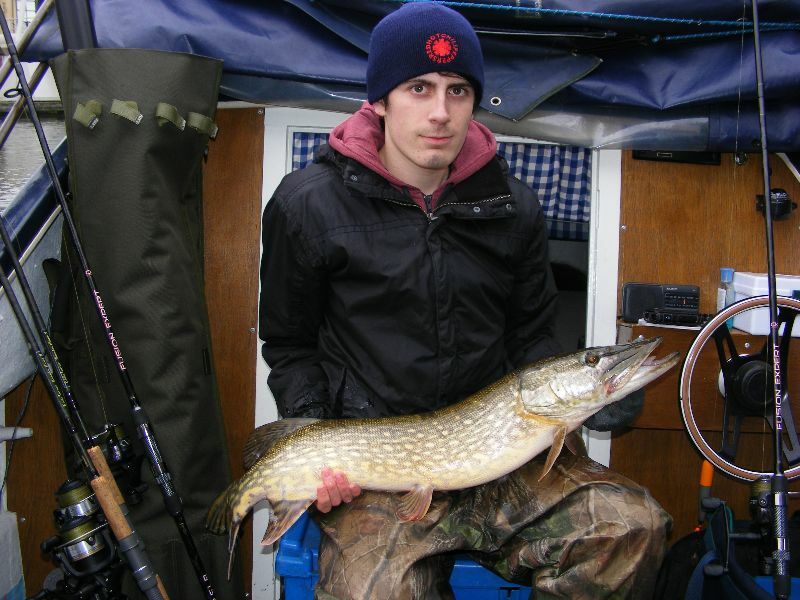 Its been around 4 years proper piking for me to catch my first Twenty. Ive been very close a few times but i cant wait for the next one now ! !